The one animal that does not need any introduction is ‘street dogs’ – there are so many breeds kept as pets and away in the wild, there are two popular related ones – Wolves and Jackals. The wolf and jackal belong to the same genus, but are totally different species. The wolf is considered one of the biggest members of the canine family. Then there is the ‘fox’. In folklore, fox, considered to be very wise, is a popular animal – there is a saying in Tamil meaning that ‘waking up' seeing a wolf face would bring fortune !’…. .. ..
Of the many suburbs of growing Chennai, Perumbakkam is bound by IT hub Sholinghanallur, Chemmencheri, Medavakkam and Sithalapakkam. It is on the way from Tambaram to the IT parks at Sholinganallur. When Trigonometrical survey was initiated, Major Lambton reportedly started measuring plains with Perumbakkam hill. The Perumbakkam lake spreads over 200 acres and is a vital source of water to residents and farmers in nearby areas. Foxes are omnivorous mammals belonging to several genera of the family Canidae. Foxes are slightly smaller than a medium-size domestic dog, with a flattened skull, upright triangular ears, a pointed, slightly upturned snout, and a long bushy tail. Foxes are found on every continent except Antarctica. The hunting of foxes with packs of hounds, long an established pursuit in Europe. Foxes are often considered pests or nuisance creatures for their opportunistic attacks on poultry and other small livestock. 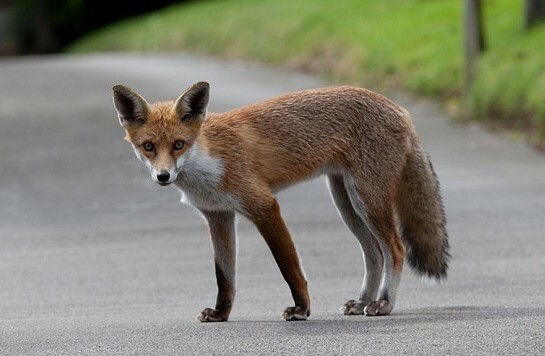 Foxes in urban areas can live longer and can have smaller litter sizes than foxes in non-urban areas. We get to see foxes and other wild animals only in Zoo, which are in news in recent times.. .. .. not the residents of Perumbakkam, as read in this report of The Hindu of date. Titled - Foxes run free in Perumbakkam, it states that the residents are scared as animals roam around TNSCB tenements. Sampath steps out of his house with a torch and a stick whenever he goes to sleep outside the building, to beat the heat. He also ensures that someone there is awake during that time. All this not in fear of burglars, but a large group of foxes that roam around the Tamil Nadu Slum Clearance Board (TNSCB) tenements in Ezhil Nagar, Perumbakkam during night time. “There are many of them that roam here, some even come in the mornings when no one is around,” he said recalling an incident where a fox entered an apartment in broad daylight. “The house was open. A lady was in the kitchen and her 5-year-old was playing in the hall. Luckily someone spotted the animal and shooed it away with a stick,” he said. S. Munisamy, a daily wage labourer, pointed to a yard where cattle owners would tie up cows and other animals, which was now empty. “In the last two months, around 15 cows, pigs, chickens, squirrels were attacked and devoured by these foxes. We keep spotting their half-eaten carcasses every alternate day. After the fox menace grew, people began taking them elsewhere, some even keep them in the apartment. They have to protect their business after all,” said Munisamy. “When their wilderness shrinks they will step out to other areas for shelter, water and food. This is expected,” said A.C. Edison, forester at Velachery forest department. “They might be coming from the bushes nearby but instead of panicking we advise people to inform us on spotting one. They need to be rescued and sent to the zoo ,” he said. The official advised residents to step out with torchlight during nights. “The moment you flash light on their eyes they will standstill and do no harm,” he said. People can contact 044-22200335, Velachery Forest Range Office, if they spot any animal that needs to be rescued. Fox News [Fox News Channel (FNC)] is an American basic cable and satellite news television channel, owned by the Fox Entertainment Group subsidiary of 21st Century Fox. Millions of American households receive the Fox News Channel. The channel broadcasts primarily from studios at 1211 Avenue of the Americas, New York City, New York. The channel was created by Australian-American media mogul Rupert Murdoch, in 1996.